7ft 6 in x 6ft 6 in., 229 x 204 cm. Property of Captain Benson, Hyde Park; His sale, Christie’s 28 July 1877, lot 148, “Unknown Equestrian portrait of a youth”; Bt. Waters for £7.7.0; Italian private collection by 2009. The sitter in this rare equestrian portrait of a young boy had been traditionally identified as “John, Duke of Marlborough”. The date of the portrait, the 1680/90s makes it impossible that the sitter is the first Duke of Marlborough, although his short-lived son (1686-1703) was also called John. Unfortunately, the portrait appears to have had no firm identity attached to it when it was sold from the collection of a Captain Benson in 1877 at Christie’s, where it was described simply as an “Equestrian portrait of a youth”. Although the early provenance suggests it was originally painted in England, the fashion is in some respects a little unusual, and may suggest instead that it dates from Michael Dahl’s early career in Sweden, or possibly his brief period working on the continent before he settled in England. The short curled wig, jacket with vertical pocket flaps, long open coat cuffs and the fringed gauntlet gloves were all popular in Europe in the 1680s. However, it could be that the sitter was wearing a riding outfit cut for a child, or that he was from an English family wealthy enough to warrant the very latest European fashions. The iconography is also unusual. The broken columns and damaged masonry, together with the more triumphant depiction of the sitter on horseback, may suggest that the young sitter is being depicted as head of his family after, perhaps, the early death of his father. Dahl, who was born in Sweden, trained under the Swedish court painter David Ehrenstrahl, who was well known for his equestrian pictures. The composition of the horse in the present picture is very close that seen Ehrenstrahl’s 1676 portrait of Charles XI of Sweden [Gripsholm Castle]. Like many Swedish artists, Dahl left Sweden for London in 1682 in search of patronage. Political turmoil in Stockholm had reduced the wealth and power of the aristocracy, and a number of Dahl’s compatriots saw England as being relatively stable and prosperous. Dahl worked briefly in Kneller’s studio, but then travelled to Rome to study further, copying old masters and successfully seeking commissions from the exiled Queen Kristina of Sweden. This last fact may be explained by his secret conversion to Catholicism. In 1688 he set out to return to England, where he may have been hoping for support from the Catholic King James II. But Dahl arrived in early 1689, by which time the ‘Glorious Revolution’ had deposed James and replaced him with his daughter Mary and her Protestant husband William of Orange. 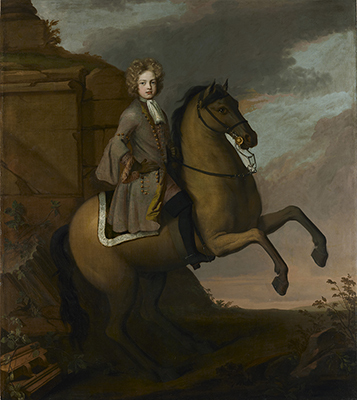 Dahl did not portray the new monarchs, but gained much patronage from the rest of the court, and in particular Prince George of Denmark, the husband of the future Queen Anne, who was portrayed by Dahl in a 1704 equestrian portrait very similar to that seen here [Royal Collection].